Punjab PMET 2016, the Pre Medical Entrance Test is being conducted by BFUHS. The medical entrance exam Punjab PMT 2016 for admission to government and private medical and dental colleges in the state of Punjab, will be held on 11 Jun 2016. MBBS / BDS admissions in the state colleges shall be on the basis of merit obtained by eligible medical aspirants in this Punjab Pre Medical Entrance Exam (PMET) 2016. FInal Selection list for BDS admission 2016 has been announced. Check “Counselling” link below. BFUHS PMET 2016 was previously to be held in May. Then due to introduction of NEET it was cancelled. Finally, considering per the final ordinance and order of Supreme Court Punjab PMET 2016 was conducted on 11 June 2016. New details of Punjab PMET 2016 have been updated on this page. 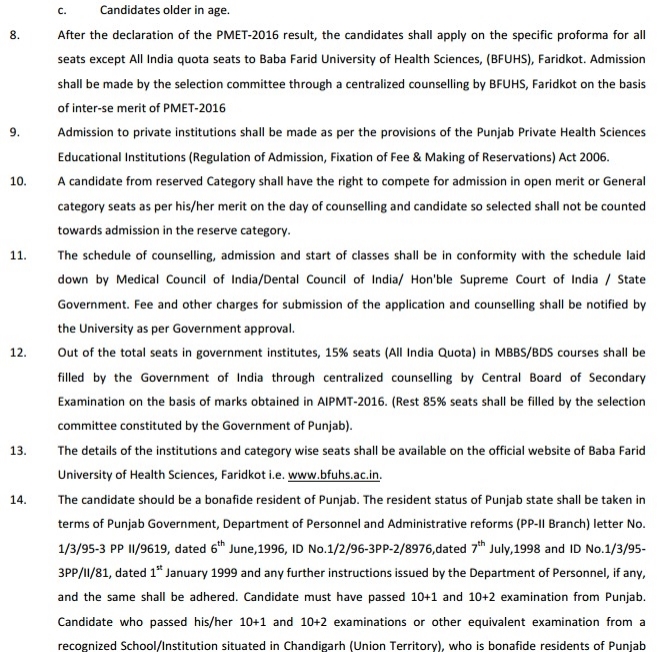 If you wish to appear in Punjab PMET 2016, you will be required to understand the eligibility conditions, procedure of admissions as laid down by Baba Farid University of Health Sciences, Faridkot. For the information of candidates, complete details of Punjab PMET 2016 such as exam dates, application form, pattern, admit card, results and selection procedure are given here. Notified on 30 May 2016 – On account of non-availability of the computers, the online PMET – 2016 of Baba Farid University of Health Sciences has been rescheduled for 11th June (Saturday). There will be many centres in Punjab as expected number of applicants appearing in the test is pproximately 16000. Because of this high number, agency is compelled to have a few centres in the adjoining states like Haryana and Jammu. Efforts are being made to allocate a centre which is near to district of the candidates. The candidates who have appeared in the Punjab PMET 2016 can now get the official answer key and question booklet for the entrance test. These Answer Key & Question Booklet are released by BFUHS and are available on their official website. The candidates can also download the same Answer Key & Question Paper for PMET 2016 using the direct link provided below. Mock Test for PMET 2016 has been launched for all the PMET candidates. Mock test is provided so that test takers can prepare for the exam pattern. A dummy log in ID is given to the candidates so all you need to do is just visit the official PMET Mock Test and familiarize yourself with the way questions are displayed in Examination. Check out the official Punjab PMET Mock Test before appearing for your exam. Click here to Start the PMET Mock Test. To appear in the entrance examination, candidates must determine their eligibility from below. Once it is established that they are eligible for Punjab PMT 2016, they must fill the application form issued by Baba Farid University of Health Sciences. Personal information such as name, gender, date of birth will have to be filled in the form. Additionally, candidate will have to share contact details, and guardian details. The educational qualifications mentioned in the Punjab PMET 2016 application form should be correct and verifiable, as should be the rest of the information that candidate fills in the form. 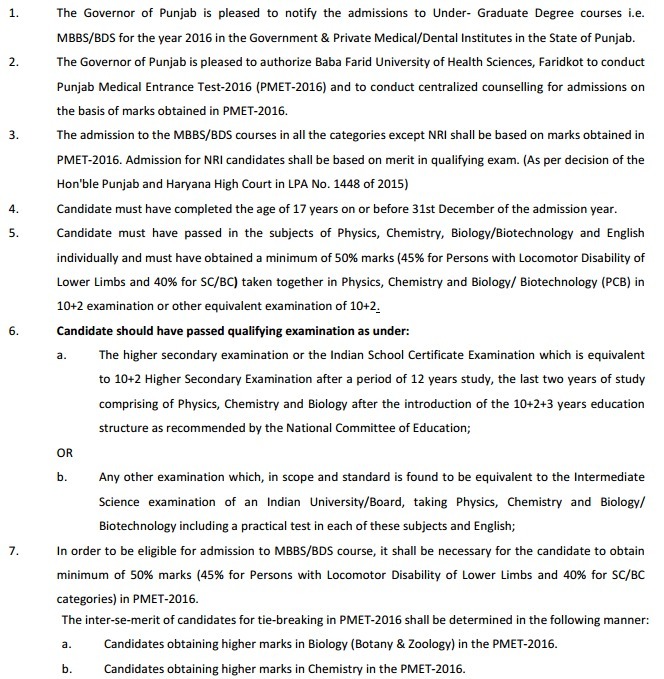 BFUHS is released details of the following regarding Punjab PMET 2016 application form. Category I: NRI/Children of NRI who originally belong to the State of Punjab. Category II: NRl/Children of NRI who originally belong to an Indian State other than Punjab. Admit Card issued to such candidates who would have submitted their application forms on time. Admit card of Punjab PMET 2016 shall be the hall ticket to be carried to the examination hall on the day of exam. As per the choice of examination center selected by candidate in the application form, as is the norm, candidate shall be assigned test center. This shall be indicate and printed in the Punjab PMET hall ticket. As to when and how the admit card (hall ticket) will be obtained by the candidate, has been elucidated in the IB. Timing of Examination: will be mentioned on the admit card. Centre(s) for the conduct of PMET-2016: will be mentioned on the admit card. For more detail of Punjab PMET 2016 – Download Information Brochure.